Korra knows that fit is non-negotiable when picking up a pair of jeans. So each pair of their raw, selvedge is custom made for you by a single tailor who crafts them all through and letters his name on the label. Heavy denim for a fit that gets better as it takes your form. No-fade raw selvedge for a clean, sharp look that ages with you. Natural dyes and organic cotton threads. Sustainability and simplicity all around. All of these are hallmarks of Korra that come together for a great pair of solid, custom-fitted jeans with a really clean vibe. Whether you feel good or not about how a pair of jeans fit is quite instantaneous, in my experience; it’s probably not going to grow on you later. You know what’s a good fit for you and how you like them to be. And quite often, trying to find that is surprisingly difficult. Not everyone knows their denim. A lot of the time, salespeople will give their thumbs up to a fit that’s just downright off. 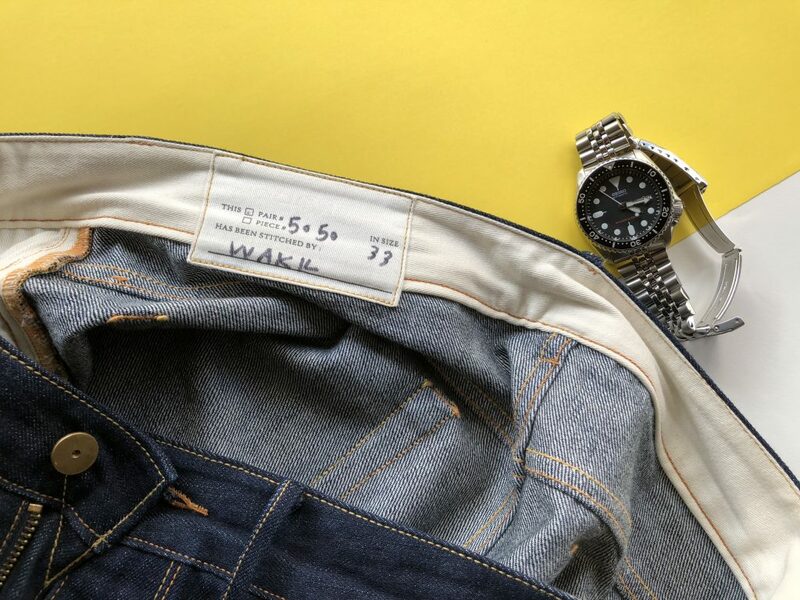 Of course, they have jeans to sell and denim makers have their fits and sizes down to standard patterns, but this doesn’t leave wiggle room for the little things. Maybe you want it a bit tighter at the thigh, or you want less taper. So you’re stuck, unless you step it up to premium Italian or Japanese makers. I found myself in this boat when my go-to jeans had absolutely given up on me after a decade of loyal service. I even measured them top to bottom in the hope of finding an identical pair elsewhere. It wasn’t to be, till a friend who’s a bit of a denim freak told me about Korra. My experience with Korra was in-store last year (the store is now closed, unfortunately, as they are moving to a pop-up only model). They start you off by making you try a few fits and sizes, based on what you’re looking for. The stock fits are Slimmer, Slim Taper, Slim Straight, Comfort Straight and Athletic Straight. Depending on which basic one works for you, you can ask for tweaks as per your preferences. You are likely to get some honest and helpful suggestions from the people assisting you. Once fitting and measurements are done, changes are marked on the pair closest to what you’re looking for and pictures taken for reference of the tailor who would be sewing the jeans. You can then pick the denim you want and are good to go. Shyam Sukhramani (R), founder of Korra jeans, going over measurements and suggestions with a client. The heavy selvedge denim they use is great for a better fit due to its structure and how it maintains form. Selvedge is basically fabric with a finished ‘self-edge’ when it comes out of the loom that prevents fraying and unraveling. Which means it is more durable and generally of a higher quality than one without such finish. This was the old-school way of doing it; a less popular method now in the age of mass-production. I personally think it looks absolutely great. But it’s also the least common form of denim nowadays with not enough shuttle looms available for making it, as it’s more premium and expensive. At a good brand overseas, you would generally pay between ₹7,000 – ₹21,000 for a pair of selvedge denim. Selvedge is the old-school way of doing denim on a loom; a less popular method now in the age of mass-production. Garment manufacturing in India is predominantly done on an assembly line, with each craftsman having a fixed domain that contributes to a part of the outcome. This approach is quite likely to dilute one’s passion, which plays into many goods in the market lacking a certain individual character. 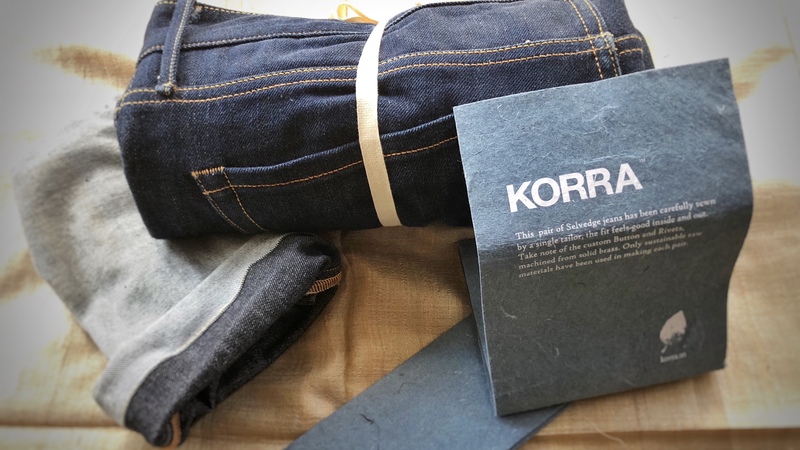 Korra goes against the tide and has a single tailor stitch the entire pair of jeans, which is individually signed and numbered. It naturally encourages the creator to be more devoted to what they are producing. There’s a certain undeniable goodness and charm to an article that is completely handmade. With its little individual variations, each will have its own uniqueness that is borne out of the emotion that went into making it. The same is true for the jeans Korra makes. Along with the kind of materials they use, this outlook adds up to beautiful denims with a very natural quality about them. In their original avatar back in the 19th century, denims were no-frills utility work wear for miners and the like who needed tough pants to withstand the hard usage inherent to their jobs. For this reason, the raw nature of Korra’s jeans feels like a nice throwback. Everything you need, nothing you don’t. Down to the buttons and rivets, it all looks purposeful. Korra means blank or clean. This extends to the sustainability angle as well. 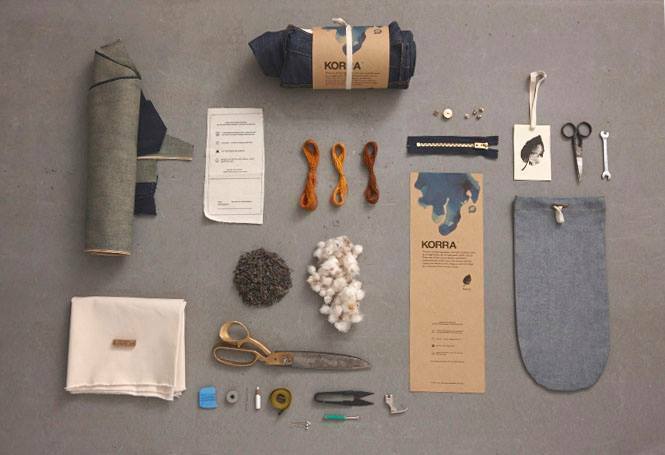 They use natural dyes and organic threads with no chemical treatments to the fabric. 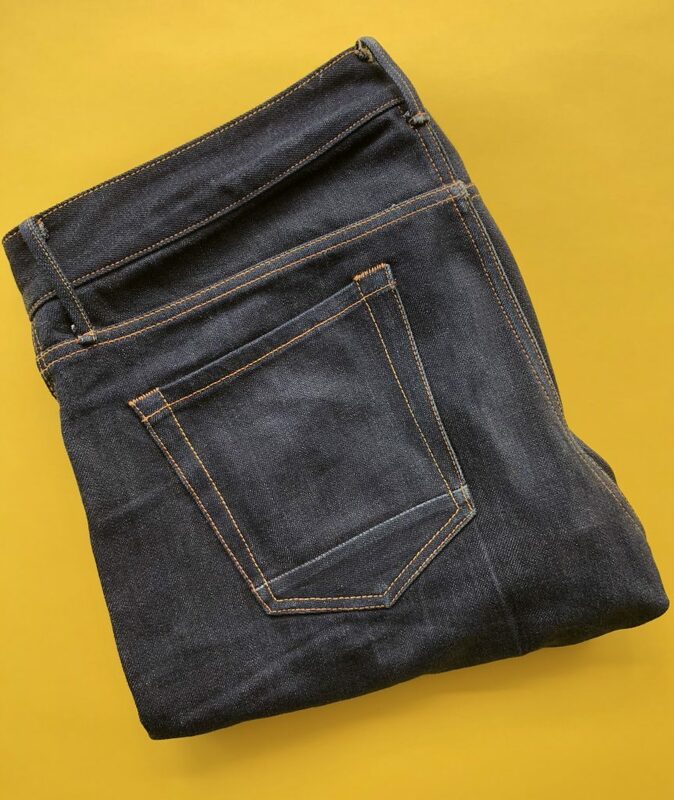 While the twill lining is 100% organic cotton, the denim is made from either organic cotton, or at the minimum, from 25% Better Cotton Initiative (BCI) content. In line with their responsible consumption philosophy, the brand states that they want your jeans to last longer. They offer a repair service as well, in our times of use-get bored-throw cycles. Initial stiffness is an innate quality of raw denim as by definition, there is no pre-washing or softening in the production process. They do, however, break in naturally and nicely. There are two things worth mentioning here. One, breaking in the piece of clothing you probably wear most isn’t going to involve a lot of waiting or effort. Two, let’s face it, even softer denims aren’t your most ‘comfortable’ pants anyway. I think we attach the comfort notion to denim because of their versatility and ease of use, rather than actual physical comfort. Cotton and its other blends are far more comfortable, per se. Raw denim, according to me, looks better than a pair of faded jeans and is far more versatile across the dressing spectrum. So I can consider these attributes to be advantages of raw denim, more than anything else. These days, pre-fade is quite omnipresent and it’s actually harder to find jeans without it. My inability to find a good pair of unwashed jeans from the big names is what actually organically led me to Korra. Wearing them is actually a great way to personalise your jeans and write your own story on them, because they’ll pick up wear and fade from exactly how YOU use them. Different wear patterns will appear based on how the jeans are actually worn and what they are subjected to, to show true character rather than a faux distress pattern. You could label it a slightly romantic take on the matter, but there is joy in these little things. Who’s it for: The one looking for sharp looking raw denim without washes and fades, made to a very high standard, without spending Italian designer label money. Talking point: These jeans come from one tailor, not from an assembly line, and I know who made them. Cool little detail: Korra went one step ahead with embodying their name and didn’t even put a back label. Pricing: Jeans for men priced between ₹4,900 – ₹6,900. Jeans for women priced between ₹2,900 – ₹6,900. Denim jackets and blazers for men and women priced between ₹3,900 – ₹8,900. They also do denim skirts for women, priced between ₹3,900 – ₹6,900. Korra is relaunching in a new avatar where they will regularly be doing pop-ups across India as well as overseas. They do not intend to have any physical stores. Details on upcoming pop-ups here. You can also buy online on their website korra.in. Sizing with selvedge denim can be a little tricky. It also wears in and loosens differently. 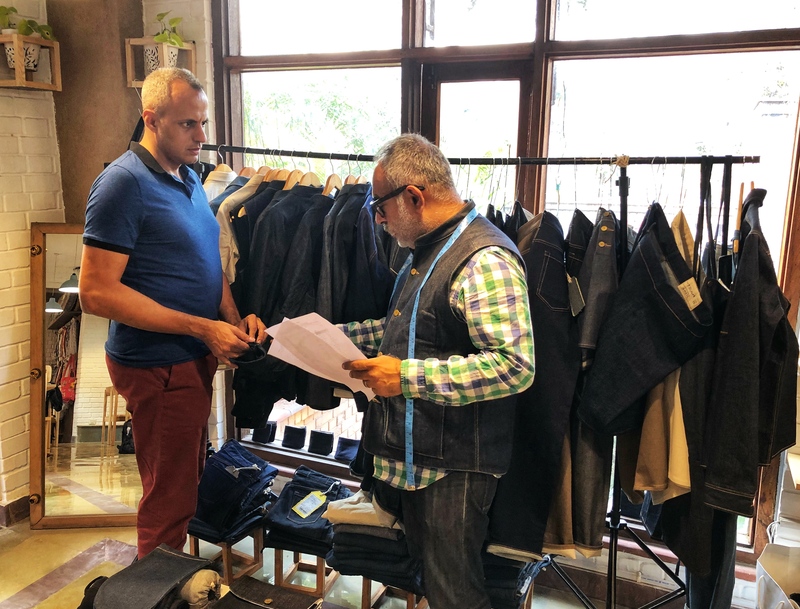 So it is recommended to visit one of the pop-ups or head to their workshop in Okhla, New Delhi to get measured for the fit you’re looking for. And if you want to get more nerdy about it, check out this video. How did you hear about Korra? Let us know in the comments below. And if you found this story interesting or useful, please spread the indie brand goodness by sharing it!